In The Binding of Isaac you play as Isaac, a crying child who is lost in his labyrinthine basement with all sorts of horrible monsters after escaping down there from his abusive mother. You must fight your way through the seemingly endless rooms and layers of the basement to progress forward with nothing but your projectile tears as a weapon. 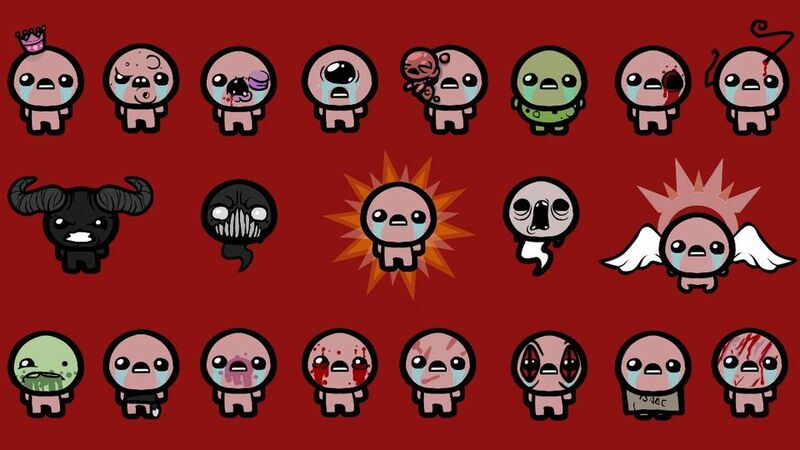 The Binding of Isaac is a rogue-like indie game designed by Edmund McMillen, the creator of Super Meat Boy, and Florian Himsl, programmer for Coil and The C Word, in 2011. This is a horror themed dungeon crawler game that involves clearing floors of enemies and bosses with only 1 life. If you die once, all progress is lost and you must start over again from the beginning. Binding of Isaac start screen. The game begins with a short introduction involving Isaac and his mother before the events of the game. Isaac's mother is a religious zealot who would watch Christian broadcasts all day long while Isaac played. One day, Isaac's mother hears God speak to her and tell her that Isaac has become corrupted and must be punished to purify his soul. Isaac's mother does what God asks until eventually he asks her to kill her son, without hesitation she grabs a knife from the kitchen and heads towards Isaac's room. Isaac luckily sees his mother through a crack in his door and jumps in to the basement through a hidden door under his bedroom rug. The rest of the game involves Isaac fighting monsters and demons from the Bible as he looks for an escape from the Hell he finds himself trapped in. The rest of the story is hidden in the background and is rarely spelled out for you, which makes it more appealing to people who prefer to analyze every detail to piece together the plot. The game is randomly generated each time you play. The layout of each room, enemy patterns, upgrades and bosses are all completely different each time you play, you will get to experience this first hand as the game is brutally difficult and resets all progress when you die. Some items will be unlocked permanently in the store after boss fights have been finished, but the appearance of these items in the store is random as only a few items are available in the store at any one time. 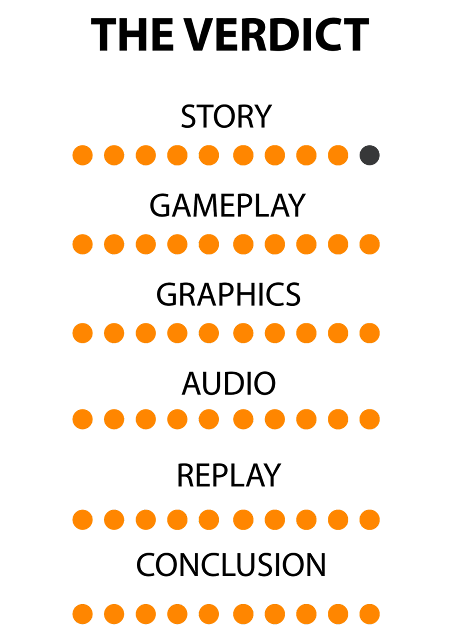 The upgrade system is completely random and has effects such as making your projectiles track, making them fire rapidly, causing them to fire at a slower rate, increasing your own hitbox or increasing movement speed. There are a huge number of upgrades that give all sorts of abilities and perks, you likely will not see the same upgrades twice, which makes staying alive much more important when you are lucky enough to acquire a powerful upgrade. This is a great feature because it makes each run exciting as you never know what you're going to get. The rooms have random enemy types and placements that usually give a decent challenge to the player by either erratically shooting projectiles in various directions or by closing in on the player quickly by using a variety of tricks unique to that monster type. Enemies, bosses and piles of poo all have random chances to drop health, coins, keys and bombs which are vital tools for finding upgrades and clearing blocked off areas.. Rooms can have pits, fires, narrow hallways, rocks to be used as cover and piles of poo scattered throughout in various ways. They are always paired with enemy types that work well with the environment, which is surprising as random generation in games tends to create imbalanced and poorly structured levels. The Binding of Isaac succeeds greatly in this regard. The U.I (User Interface) features a small, but very helpful map in the top left corner that shows all rooms that have been explored and any items that you did not pick up. This is very helpful as items such as hearts, which are used to regain health, remain in the level forever until used or until the player descends to a new floor. When low on health before a boss, you can quickly see which room has a spare heart that you left behind and find your way to it very easily. A simple feature such as this makes exploring rooms much more convenient because the rooms tend to look very similar and can be confusing. This game has a very appealing art style that portrays grotesque and disgusting enemies as cute and goofy looking cartoon characters. The themes and imagery used is very dark and in some parts disturbing, but the monsters never lose their charm thanks to the cute art style that is used consistently throughout. Isaac has grown horns and gained some weight. 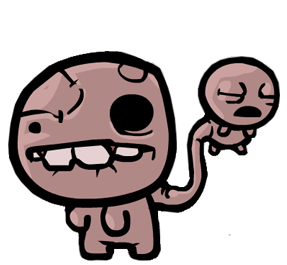 Upgrades all have visual effects on Isaac such as making a third eye appear in the center of his forehead, or making a tumor grow from the side of Isaac's face. If you live long enough, mutations will continue to build up until Isaac begins to look like a monster himself. Enemy designs are creative and grotesque, but rely heavily on body horror and shock value. There is a huge variety of enemies that all have different strengths and weaknesses. The creators managed to make the monsters look unsettling without changing the art style at all, which is impressive. There is plenty of replay value in this game as there are multiple unlockable characters who each have their own gimmicks that change your gameplay style, their abilities also tie into the story. 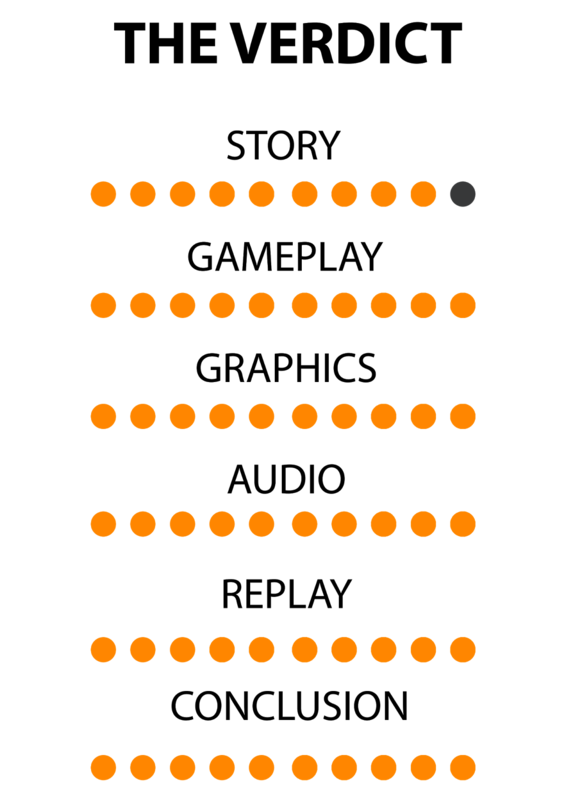 Characters are unlocked by reaching certain milestones within the game, such as beating bosses or earning achievements. These new characters can make the game feel fresh on a new run. There are also multiple endings that reveal different aspects of the story. The randomly generated levels means that each run will be completely different. You could get lucky and have a powerful upgrade drop early, or you could have terrible luck and be given a debuff that makes your character weaker in some way. This uncertainty makes the beginning of each run exciting, as you could get any combination of powerups that make your playstyle completely different from the previous attempt. The Binding of Isaac is a fun, challenging game with a heavy overtone of filth, gore and unease that will make you want to continue playing each time you die. The game is definitely tough, but it is beatable once you learn how to play effectively. The music, visuals, gameplay and enemy designs are all good reasons to keep you pressing forward to see what new horrible designs the game has in store for you. This game is definitely not for everyone, though. People who are easily frustrated should avoid this game as losing all of your hard-earned progress due to simple mistakes is enough to annoy anyone. The appeal of this game is mainly the challenge and the fun, varied gameplay that is not at all hindered by the game's heavy use of random generation. 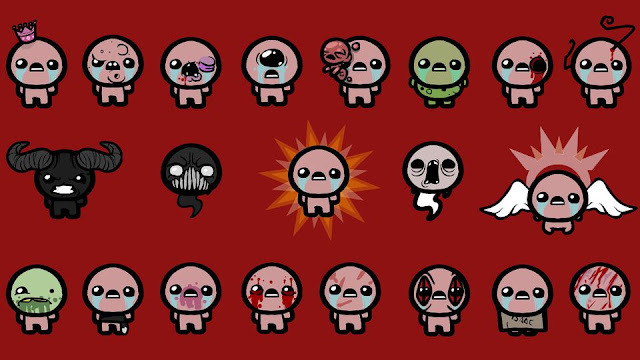 The Binding of Isaac: Rebirth and The Binding of Isaac: Afterbirth have since been released with more bosses and unlockable characters.